shall be supported as feasible today, at a similar cost and power consumption level. A specific challenge is to provide realistic and high quality wave propagation models that are required for a successful development and optimization of the evolving radio access networks. Therefore both more efficient transmission schemes and additional spectrum allocations are needed. Higher frequencies in the millimeter wave range have the most promising prospects for providing the required additional spectrum. have been extended to account for the specificities of the higher frequency bands. This includes the definition of the electrical properties of typical construction materials regarding transmission and reflection for higher frequencies up to 75 GHz as well as the consideration of atmospheric absorption effects like the oxygen absorption at 60 GHz. 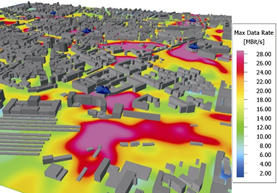 A wideband propagation measurement campaign at 73 GHz in New York City has been used to verify that the WinProp ray tracing model is able to correctly predict the propagation characteristics also at mmWave bands. In 5G ultra-dense networks with more than 1,000 small power base stations in an area of 1 km2 in urban areas shall be utilized to provide the required high data rate volumes. For this purpose multi-threading is implemented in WinProp to compute the ray-tracing simulation for a large number of base stations simultaneously. Envisioned transmission schemes, like massive MIMO expanding the MIMO antenna arrays into the z-domain and including more than 16 antennas on the normal base station, put radically new requirements on the channel modelling, especially in the spatial domain. 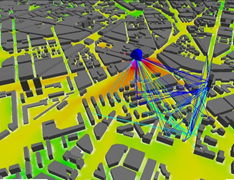 The WinProp ray tracing models have been used to estimate the elevation spread of departure angles (ESD) behavior in various city environments, but also the spread in the azimuth domain.